The Wheel: "You Want All-Over? OK, How About This?" Recently I had a conversation in which I wondered how many great painters are working today. A century ago, there was Matisse, Picasso, Rousseau, Mondrian, Kahlo, O'Keefe, Pollock, Dali, and more. Who can name anyone in their league today? The Dallas Museum of Art is currently showing an exhibition by Laura Owens, who it calls "one of the most influential artists of her generation." 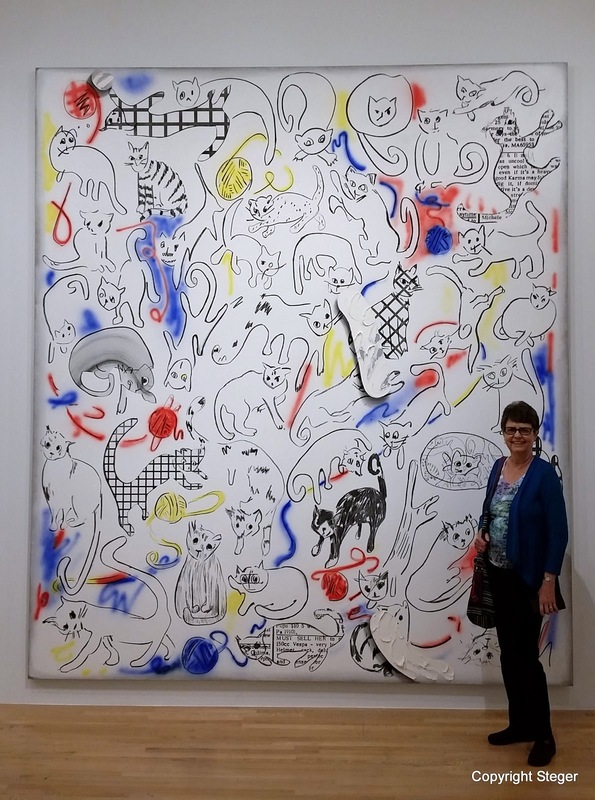 Well, OK.
Another of her works from 2013 is an almost twelve-foot-tall painting with line drawings of cats playing with balls of yarn dispersed over its white ground (see illustration above). Some drawings are carefully executed and others more slapdash; some are in plaid, others in the grid patterns that Owens is so fond of. Here and there are touches of spray paint in raspberry, yellow, and blue. It’s like a motif that one might find on a young girl’s flannel pajamas, something a sophisticated seven-year-old would find amusing and a bit arch. This is a painting that says: You want all-over? OK, how about this? This is the way to be ambitious now. You don’t always have to throw your Sunday punch. "A young girl's flannel pajamas." Nailed it. Other "paintings" feature felt, needlework, silkscreen, digital printing, buttons (!) and other techniques that leave the whole exhibition feeling more than a little haphazard. Halfway through the exhibit I decided that if it wasn't for the sign at the entrance of the exhibition, one might have a hard time knowing they were all done by the same artist. The DMA calls the exhibition a "mid-career survey." 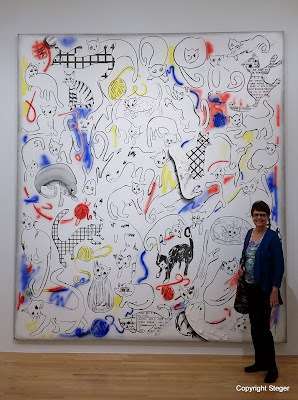 I just hope that Laura Owens finds something she really likes and works at it to get really good at that.